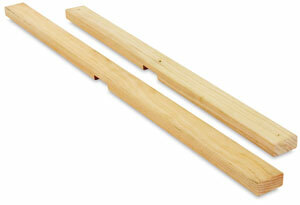 These cross-braces are made with the same quality and care as the Best Medium-Duty Stretcher Bars. They're made from kiln-dried, knot-free, straight white pine. Price is per strip, not per pair. Made in the USA. Only for use with Best Medium-Duty Stretcher Bars. Cross braces are made with the same quality and care as stretcher bars. ™ Best is a trademark.® Richeson is a registered trademark.